Recent days brought the announcement that a joint venture between Virgin Trains and Stagecoach has won the franchise to run the East Coast mainline rail route. The network, which runs between Edinburgh and London, has been in public ownership since 2009. What can YouGov data tell us about the move? 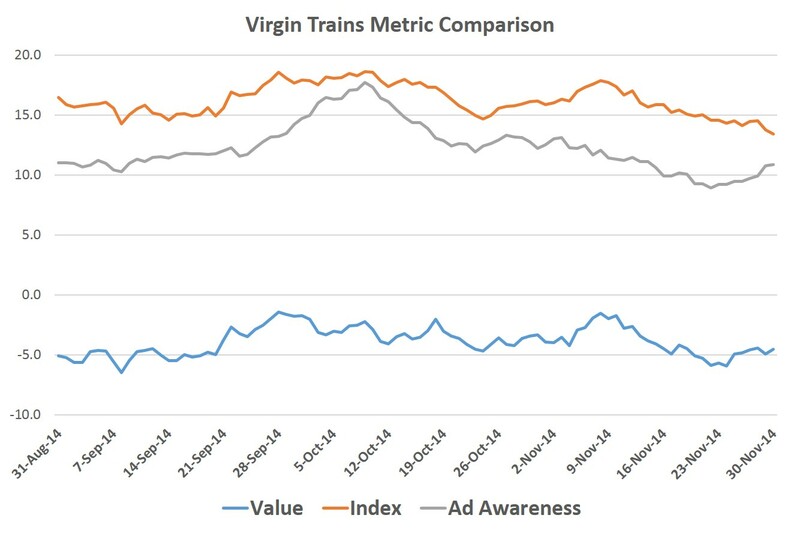 Well, we can examine BrandIndex data from the last few months to determine how perception of Virgin Trains has developed over that time. First of all, travellers on the line will want value for money. However, judging from YouGov’s Value metric there is a perception that the operator does not currently offer this. Virgin Trains has a negative rating. Their average score over the past 3 months is -3.8. It is a problem among all operators, with Britons on average paying far more than their European counterparts. Indeed, the only six out of twenty five travel operators tracked by YouGov have a positive score on the value metric. Nonetheless, Virgin Trains will be keen to avoid accusations of greed and avarice once it commences its management of the line. There is better news to be had when considering the company’s Index Score (made up of a variety of metrics; reputation, impression, satisfaction, quality). Here we see that Virgin Trains achieves a solid score over the past 3 months. There average rating for this time is +16.2. Virgin Train’s marketing efforts have focussed around a new directive which wants passengers to ‘Arrive Awesome’. The campaign hopes to help convince and win over the general public, whilst aligning itself with other Virgin services. There was a definite uplift around the time of the launch of the campaign (17th September) although that has died down now. The ad awareness score rose to a height of +18.6 mid-way through October. Bosses will be hoping subsequent adverts and multi-platform campaigns have a longer lasting effect in order to fully translate to viewers the new Virgin Trains approach. Of course, Virgin and Stagecoach will be judged on their record of punctuality and level of service once they take on the East Coach franchise. It’s clear that they have not been uniformly loved in the service they have provided so far, will this change for the better?